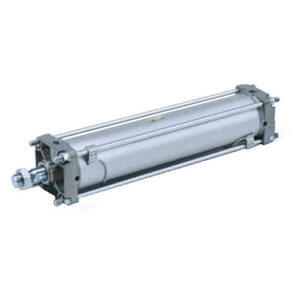 Series CA2 double acting, single rod version of the light weight tie rod air cylinder. Fine end of stroke cushioning adjustment is now possible due to the increase in the air cushion adjustment range. The CA2 can be ordered with rod end or rear pivot brackets. The CA2 is available in a large variety of options that will make them suitable for many different applications. A variety of auto switches are available for mounting, including compact switches and magnetic field resistant switches. The CA2 is available in 40, 50, 63, 80 and 100 bores sizes, and is RoHS compliant.